Product prices and availability are accurate as of 2019-04-23 10:17:59 UTC and are subject to change. Any price and availability information displayed on http://www.amazon.com/ at the time of purchase will apply to the purchase of this product. Serve up your favorite foods around the campfire or portable stove with the Coleman 24-Piece Enamel Dinnerware Set. 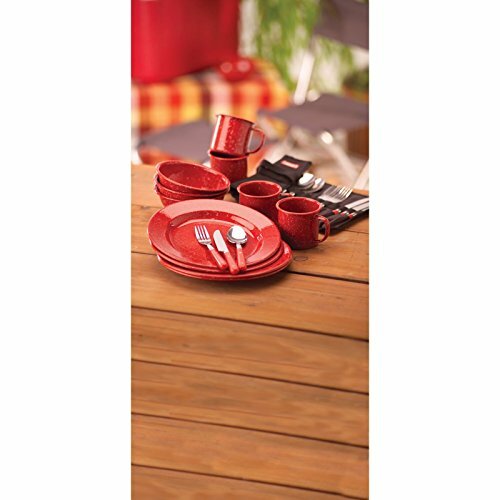 Made of double-fired enamel and featuring a timeless red speckled design, this outdoor dinnerware set offers classic style and durability and is dishwasher safe for easy cleaning. 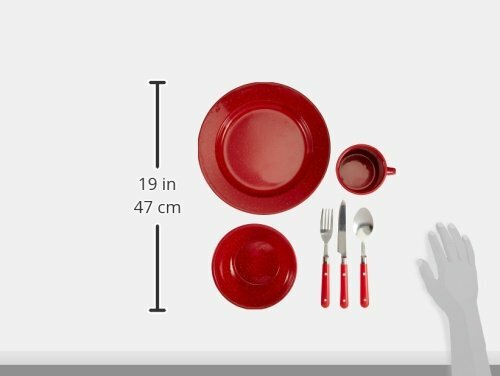 This 24-piece set includes four 10-inch dinner plates, four 12-ounce coffee mugs with handles, and four 6-inch bowls, making it a great choice for family meals at picnics, BBQs, and campsites. It also includes a silverware kit with four plastic-handled forks, spoons, and knives stored in a convenient roll-up pouch for easy organization and storage. Ideal for camping, picnicking, and even backyard use, this set of Coleman speckled dinnerware includes everything you need to eat a meal under the stars. The 24-piece set is outfitted with four 10-inch dinner plates, four 10-ounce mugs, and four 6-inch bowls, giving you and three co-campers enough containers for a main course, a side salad, and an after-dinner hot chocolate. In addition, the set comes with four knives, four spoons, and four forks, so you don't need to rely on plastic silverware when eating. 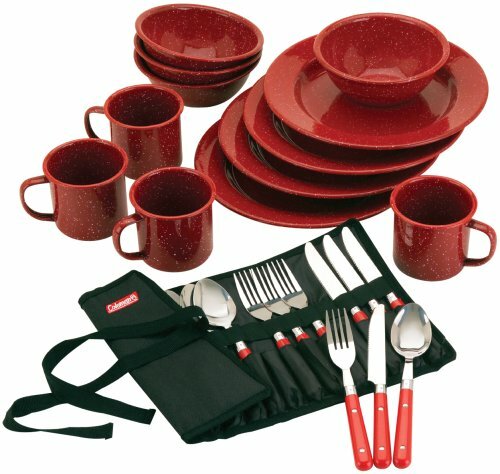 Best of all, the set is durable and dishwasher-safe, with a red-speckled enamel surface that holds up to heavy use. The silverware also includes a compact carrying case to keep the cutlery bunched together. The Coleman Company has been creating and innovating products for recreational outdoor use since W.C. Coleman started selling gasoline-powered lanterns in 1900. Inventor of the hugely popular fold-up camp stove, Coleman developed a plastic liner for his galvanized steel coolers in 1957--the birth of the modern cooler--and the company has been improving their utility and design ever since. The array of products that bear the Coleman name now includes just about everything you might need to work or play outdoors, from tents and sleeping bags to boats, backpacks, and furniture.